F521 wandered alone, looking for other wolves. F521 had grown old. She was 12 and had lost the dominant status in her pack. She wandered from her home range and met up with her son-in-law and two grandsons. Toward the end of her life F521 was slowing down. She stayed in one location for many weeks. Her grandsons visited her often. The two young Mexican wolves may have tried to mate with F521, or perhaps they were bringing her food. F521 wasn't able to kill game like she once was able to do. She had grown thin and weak. Wildlife managers and biologists avoid giving wild animals' names. F521 was no exception. Jeff Dolphin described F521's life story to illustrate the strength and ability of Mexican wolves raised in captivity and then released in the wild. Dolphin leads the Mexican wolf recovery team for the Arizona Game and Fish Department. Five agencies co-manage the project. The Interagency Field Team is made up of wildlife specialists from the Arizona Game and Fish Department, U.S. Fish and Wildlife Service, White Mountain Apache Tribe, USDA Forest Service, and USDA Animal and Plant Health Inspection Service, Wildlife Services. When F521 was 13, she was shot and killed in western New Mexico, near the Arizona border. The gunman is unknown. To date, she is the longest-lived Mexican wolf in the wild. "There are a lot of wolves out there that are directly related to her," Dolphin said. Reintroducing a predator species to its historical habitat manifests dispute between wildlife agencies, environmental organizations, and people who are affected by the animals' presence on the landscape. 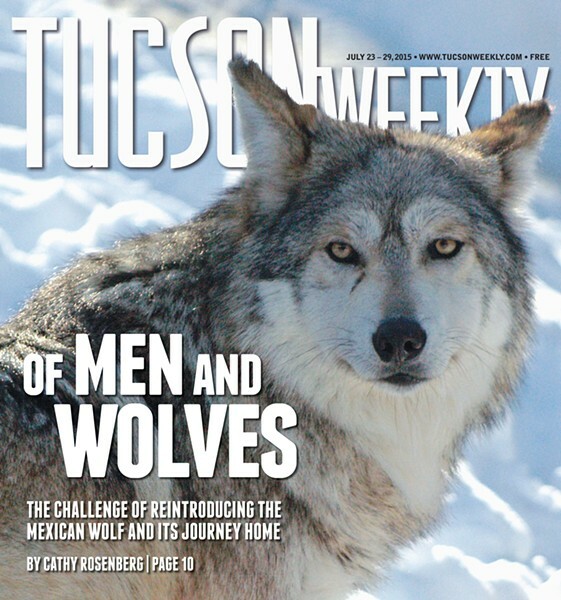 The effort to reestablish the Mexican wolf in Arizona and New Mexico has met many challenges because the wolf competes with human use of the land. Wolves roam among domestic animals, threatening the livelihood of ranchers and perhaps altering the future of public land and the wilderness. Despite differences, and in some cases, opposition to the reintroduction of the Mexican wolf, the challenges have been met with sometimes ingenious, and sometimes practical and straightforward solutions. "The reintroduction of the Mexican wolves was the most difficult of any projects to reintroduce wolves anywhere," L. David Mech said. Mech is a senior research scientist at the Northern Prairie Research Center with the U.S. Geological Survey. He has studied wolves for almost 60 years. "The animals were all captive-bred and lacked the skills to survive in the wild," Mech said. Even though the wolves were catching elk, initially they also attacked livestock and roamed near human activity. "They were released in an environment that lacks large, expansive wilderness areas free of livestock." When the first captive-raised Mexican wolves were released into the wild in 1998, no one knew what the outcome would be. In captivity the wolves were protected. They were fed. They didn't hunt or raise pups while exposed to harsh winter conditions. Once the wolves were released some supplemental food was provided, but the wolves would have to rely on instinct to survive. F521's release was part of the test for the future of the Mexican wolf in the wild. F521 had been brought into the Mexican wolf restoration project from the Cheyenne Mountain Zoo in Colorado Springs, Colorado, in 2000. She was taken to a pre-release facility in east-central New Mexico, where she mated with M507. F521 was released into the recovery area with her mate and a litter of their pups in 2002. F521 and M507 became the alpha female and male for the new pack, Bluestem. The pair had no training on how to hunt and kill prey, yet they quickly acclimated to their new environment and learned on their own how to catch elk and deer. F521 and M507 raised many litters of pups together. Then, in 2006, M507 disappeared. When he was found he had been dead for so long the cause of his death was unknown. The pack finished raising the pups without the alpha male, and in 2007, F521 took a new mate. She was now 10, and the new litter was the last of her pups. In 2008 one of her daughters pushed her out of the pack. For a while, F521 was accepted by the Fox Mountain pack. The alpha female, F521's daughter, was shot, and the alpha male, F521's son-in-law, was left with their three pups. F521 joined the pack for a while, but ended up roaming alone again before she was shot. Historically, wolves were vilified. As European settlers migrated to North America, wolves were in direct conflict with humans and considered incompatible with civilized society. Wolves preyed on livestock and competed for populations of wild game also sought by humans. Wolves were shot, poisoned, and trapped. "An all-out war was launched against them," Mech said. For a while, even Aldo Leopold, known as the forefather of wilderness conservation, encouraged the killing of wolves—that is, until he watched a wolf die from his own gunshot wound. We reached the old wolf in time to watch a fierce green fire dying in her eyes. I realized then, and have known ever since, that there was something new to me in those eyes—something known only to her and to the mountain. I was young then, and full of trigger-itch; I thought that because fewer wolves meant more deer, that no wolves would mean hunters' paradise. But after seeing the green fire die, I sensed that neither the wolf nor the mountain agreed with such a view. By the mid-1900s, a viable breeding population of the Mexican wolf ceased to exist north of Mexico. Not long afterward, the same fate befell the population south of the U.S. border. As the environmental movement of the 1960s took hold, the Endangered Species Preservation Act of 1966 became law in 1973. The legislation didn't yet protect native species of fish and wildlife but encouraged conservation. At the same time a new perspective on wolves developed. They were no longer considered villain, but victim. In 1974 all gray wolves (Canis lupus) were protected under the Endangered Species Act. Two years later the Mexican wolf (Canis lupus baileyi) was recognized as an endangered subspecies separate from other gray wolves. The Mexican wolf subspecies listing was revoked in 1978. "Genetic sequencing wasn't yet available," said Dolphin, the wolf team leader. "No evidence could confirm the Mexican wolf was a subspecies." Genetic testing, which was developed in the 1980s, now shows that the Mexican wolf is a subspecies. In January 2015 the U.S. Fish and Wildlife Service again listed the Mexican wolf as a separate subspecies under the Endangered Species Act as part of a revision that would influence the wolf's recovery plan. In 1977 and 1980 the last three Mexican wolves known in the wild were captured in Durango and Chihuahua, Mexico. A single pregnant female and two male wolves were captured. These three wolves and two breeding pairs already in captivity were later certified as pure Mexican wolves. One of the two pairs was identified at the Aragon Zoo (Zoológico de San Juan de Aragón) in Mexico City, and the other pair was found at the Living Desert Museum in Carlsbad, New Mexico. The seven became the founding population for the captive-breeding program. "All Mexican wolves in both the captive and wild population can be traced back to those seven individuals," Dolphin said. "The descendants in captivity were selectively bred, and 93 percent of the genetic integrity of the founder wolves was maintained." Most founder populations need 15 individuals to retain the genetic diversity that prevents inbreeding and genetic anomalies. "But all we had were seven," Dolphin said. Thirty years passed before descendants of the seven founders were released in the wild. On January 27, 1998, 11 captive-reared Mexican wolves were trucked to Alpine, Arizona, where they were kept in pre-release pens for two months. The three packs—three breeding pairs and their offspring—were released into the wild on March 28, 1998, as a blizzard approached. Supplemental food was distributed for the wolves. "The wolves lived in captivity and were used to being fed at the same time every day," Jim deVos said. "They didn't know how to hunt in the wild." DeVos is the assistant director of wildlife management with the Arizona Game and Fish Department. Radio collars indicated the location of each of the three packs. By tracking the wolves, the Interagency Field Team, which was responsible for managing the recovery program in the wild, knew not only where the wolves were moving but could also check on their activities. Soon after release, the wolves were killing elk. Today, 109 Mexican wolves live wild primarily in a 6,800 square mile stretch from east-central Arizona in the Apache-Sitgreaves National Forests into the Gila National Forest in central New Mexico. Some wolves have begun to disperse into other parts of the recovery area. Restoring a predator to its former range has many challenges. "One of the biggest challenges with the Mexican wolf recovery is that a large portion of the recovery area is on public land," Dolphin said. The region is a multi-use landscape dominated by humans. People hunt, fish, and camp, sometimes close to wolves. Livestock graze in the national forests. Logging operations are also allowed. Inevitably, the demand for the land creates a demand for more roads. More roads bring more people and more conflict with the growing population of wolves. By comparison, wolf territory in the northern Rocky Mountains is made up of expanses of undisturbed wilderness. Hunting and grazing are not allowed in Yellowstone National Park, where a viable population of reintroduced wolves thrives. Wolves don't come in contact with livestock unless they venture outside the park. The wolves in multi-use areas die more often from unnatural causes than in wilderness areas with more limited human access. Cars hit wolves. Sometimes hunters mistake wolves for coyotes, which are legal to hunt. Between 1998 and 2014, 111 Mexican wolves released into the recovery area died in the wild: 75 were shot illegally or killed accidentally, 21 died of natural causes, and 15 died of other or unknown causes. A number of wolves were also lethally removed, relocated, or returned to captivity, many after attacks on livestock. Some wolves were released again when they were older. Achieving a balance between restoring wolf populations and managing their behavior is part of the challenge, especially in areas where livestock grazing exacerbates the conflict between wolves and humans. For wolves everywhere, "the only way to minimize conflict is to dedicate large expanses of wilderness for them," Mech said. "Where there are livestock and wolves together, eventually the wolves will prey on livestock." Almost daily, the Arizona Game and Fish Department deals with ranchers who lose livestock to wolves. Livestock owners are legal users of the land, in accordance with the Multiple-Use Sustained-Yield Act of 1960. "They pay to graze their livestock on public lands," deVos said. Compensation for livestock killed by wolves has helped ranchers cope with the challenges of raising domestic animals in areas designated for wolves. In 1987 Defenders of Wildlife established the Wolf Compensation Trust to reimburse ranchers when wolves killed their cattle, sheep, or other livestock. The program was originally designed to protect wolves in other Western states. Ranchers received $800 in compensation for a calf if it was a "confirmed" wolf kill. If the cause of death was "probable" predation by a wolf, the rancher received $400. Compensation for livestock losses changes based on the market value of livestock at the time. Although the Wolf Compensation Trust currently provides $1,450 for the loss of a cow and $2,500 for a bull, livestock operators experienced additional losses when a wolf killed a cow. They also lost the calf that the cow would have produced that year and possibly other calves in subsequent years. In addition, it can be difficult to find a dead animal on Western ranges. In the Midwest, livestock are kept in fenced pastures. "A livestock owner can wake up in the morning and go out and count their animals," deVos said. "Western livestock production is in rugged country. If an animal is missing, it is difficult to prove that a calf was taken by a wolf." The Defenders of Wildlife compensation program ended in 2010. The organization shifted its focus from compensation to prevention, working with ranchers to develop preventive techniques to reduce conflicts between wolves and livestock. Federal funds for state-run compensation were expected to transition the program to the states, but Congress did not pass the federal provision initiated in 2009. In 2011 the U.S. Fish and Wildlife Service, which oversees the management of wildlife designated under the Endangered Species Act, established the Mexican Wolf/Livestock Coexistence Council. Its goal, with support from Defenders of Wildlife, is to create incentives for ranchers to employ preventive practices that stop wolves from preying on livestock in the first place. The council took control of the compensation, which is funded by donations kept in a trust fund. "Livestock operators fund the program and are compensating themselves for their losses," deVos said. Federal grants are also a source of funding and an Arizona-based compensation program, SB1466, was recently passed. Ranchers from Arizona and New Mexico serve on the council, along with representatives from the Mexican Wolf Fund, Defenders of Wildlife, San Carlos Apache Tribe, White Mountain Apache Tribe, and rural counties in Arizona and New Mexico. Government agencies, such as the U.S. Forest Service, U.S. Fish and Wildlife Service, and Arizona Game and Fish Department, also work closely with the council. The council supports the "pay for presence" policy, a management effort that compensates ranchers who graze their livestock in wolf habitat. If wolves are present or a wolf den is located near a pasture, a rancher is compensated for the extra costs of raising livestock close to predators. Many ranchers believe that livestock respond negatively in areas where wolves have preyed on domestic animals. Some of the effects reported include lower birth rates, a decline in meat quality, and weight loss. Calves raised near wolves tend to weigh less when weaned from their mothers. At roughly $2 a pound, a calf weighing 100 pounds less than average equals a $200 loss. Although compensation for livestock losses continues, other approaches are now used to prevent wolves from preying on livestock. One non-lethal method is turbo-fladry. This technique works best to protect sheep from wolves, said Dolphin, the team leader with Arizona Game and Fish. The sheep are penned up at night in corrals surrounded by electrified fencing. A series of red or orange flags, known as fladry, hang from the electric fence. The fladry has also proved successful in deterring bears, mountain lions, and coyotes. Range riders are one of the best ways to prevent wolves from preying on livestock, said Craig Miller, the Southwest representative for Defenders of Wildlife. Range riders can track where radio-collared wolves are in relation to a domestic herd. Guard dogs can also alert range riders or sheepherders of approaching wolves. Another way to stop wolves from preying on livestock is by keeping livestock away from elk, Dolphin said. If wolves are chasing elk through livestock herds, then the predators will encounter the domestic animals. "If the elk and livestock are kept separate then wolves are less likely to prey on livestock," Dolphin said. It took eight years for the Mexican wolf population to rise above 50 animals. In other restoration areas, such as Yellowstone and Idaho, recovery took three or four years to reach the same number because wolves were still found in the wild and conflicts did not exist with domestic animals. Establishing a wild-born population of the Mexican wolf was important to the success of its restoration. "A few generation of wolves have now been born in the wild," Mech said. "Those individuals survive much better than the wolves released from captivity." The wolves released early in the project had been raised in captivity and were used to human scent and sounds. "Sometimes wolves turned up in the middle of a community eating dog food off of porches," Dolphin said. Since those early release days, the wolves have learned to be more secretive and avoid human contact. "The wolves are doing what we want wild animals to do," Dolphin said. "They are being cryptic, which is a good indicator of the success of the project." In 2005 the U.S. Fish and Wildlife Service implemented a policy to remove, kill, or return to captivity any wolf that attacked three cattle in a year. Known as SOP 13, this policy continued until 2009. The importance of maintaining a diverse genetic pool made it tough to follow this policy. Removing a wolf with important variability to the gene pool could weaken the genetic makeup of the entire population. Nevertheless, several wolves were removed each year until a public outcry and lawsuit ended the policy in 2009. Today, every wolf that preys on livestock is treated according to the special dynamics of that individual. If a wolf poses a continued threat to livestock, it may be relocated, killed, or taken into captivity. After SOP 13 was abandoned in 2009, 52 Mexican gray wolves, including only two breeding pairs, remained in the wild. Today, 19 packs of wolves roam in the recovery area—the most wolf packs since the beginning of the project, Dolphin said. Packs often consist of two to 14 members. The 2014 census results, revealed in February, show that the wild population has grown to at least 109 wolves, including 39 pups born last year. Recently, the U.S. Fish and Wildlife Service revised the section (10)j regulations to the Endangered Species Act regarding the Mexican wolf. Among other changes, the new guidelines include increasing the recovery area so the wolf can expand farther north into Arizona and New Mexico and south into its historical range in Mexico. Increasing the Mexican wolf's territory has advantages, but expanding its range into desert and other unsuitable habitat not part of its historical habitat could harm recovery and management efforts. The more wolves that get into trouble in those less suitable areas translate into more management. "We already lack the funding to launch a larger-scale wolf recovery program," deVos, from Arizona Game and Fish Department, said. Only a tiny portion of historical habitat remains in the U.S. Southwest, he said. The southwestern U.S. comprised about 10 percent of the Mexican wolf's original range, with the remaining 90 percent in Mexico. "They aren't called Mexican wolves for any other reason than they came from Mexico," deVos said. The revisions to the management of the Mexican wolf includes increasing the number of wild wolves from 100 to as many as 325 animals, as well as new guidelines on when a Mexican wolf can be killed for preying on livestock. Some critics of the program say that in order for the Mexican wolf to become self-sustaining, the entire recovery population should increase to about 750 wolves. To secure the natural and historical role the Mexican gray wolf played in the ecosystem as a predator throughout the Southwest, it is important that a large enough population, to insure their survival over time, is restored, Miller from Defenders of Wildlife said. That number may exceed 750. The vision of Mexican wolves becoming a self-sustaining population may soon become a reality. In 2014, 13 Mexican wolves birthed 39 pups—the most ever produced and surviving in a year. Some believe that if humans are the stewards of the Earth, then restoring wolves to their historical range is our obligation. Many Native American cultures associate wolves with loyalty, strength, and courage. Several tribes in North America believe that wolves are close relatives of humans. The Zunis think the wolf possesses hunting and healing powers. To many, the wolf is a symbol of the wilderness. It represents what is left of the most pristine areas in North America. Few people have seen a wolf in the wild. Those who have describe the wolf as enchanting, mysterious, bold, and beautiful. When threatened, some say the wolf becomes larger, its deep growl mesmerizing. Alert and yet cautious, wolves seem to possess an acute awareness of their surroundings, almost as if they can predict what will happen next. Wolves avoid humans, perhaps because they are naturally secretive or perhaps as a result of persecution or distrust. Since prehistoric times the relationship between humans and wolves has fluctuated as humans' perception of the wolf changes. When someone does encounter a wolf, the experience can have a life changing effect. Some say when, by chance, you meet up face to face with a wolf it feels as if the wolf can peer into your soul. Aldo Leopold said that to look into the eyes of a wolf is to find new meaning in the value of the wild and wilderness. Perhaps Leopold could have also said that when you look into the eyes of a wolf, you experience something so unusual and alluring you crave another encounter.